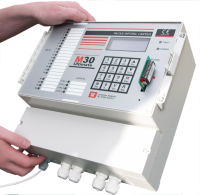 The M30 SMS Auto Dialer is an industrial unit, purposely designed for harsh commercial situations. As a commercial piece of equipment it comes with all the features you would expect; 4 to 56 individual inputs, integrated battery backup, high spec components, inbuilt surge protection and is fully configurable via its inbuilt LCD and keypad system. The M30 is used around the world in a multitude of situations from Horticulture in Wales, Hotels & Hospitals in London, Power stations in Scotland, Building management systems in Qatar, Desalination plants in Florida and Railways in Hong Kong. Each input on the M30 has its own individual SMS text message on top of that each unit has a unique identifier so you can easily distinguish not only between the different inputs but also between multiple machines. 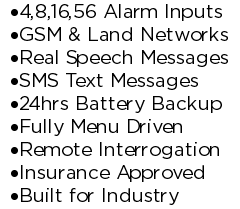 Each SMS message is fully customisable, meaning you are not stuck with a generic “channel 1 alarm condition” but with a much more useful “High temperature in building 23”. connection or optionally over the GSM network. The GSM connection can also be used as a backup; The M30 will monitor the connected PSTN line and if it fails will switch automatically to the GSM phone network. Each input/channel has its own speech message and there is also a unique identifier message the same as the SMS messages. The M30 is designed and built by ourselves in the UK, because of this if you want to customise your machine or add a bespoke feature or function then that is not a problem. If you would like to customise your M30 then please contact us or check out some of the standard features below. Below is a small subset of the features that are available on the M30, for a full list please visit the Standard or Optional feature pages. Integrated 24 hour + Backup Battery. Individual SMS alarm text messages. If you would like any more information or pricing on the M30 then please phone us on 01344 874114 or send us an email.